TFR Visualizer - Temporary Flight Restrictions Visualized on 30+ Maps! In the era of Internet of Things and with the explosive worldwide growth of electronic data volume, and associated need of processing, analysis, and storage of such humongous volume of data, it has now become mandatory to exploit the power of massively parallel architecture for fast computation. Cloud computing provides a cheap source of such computing framework for large volume of data for real-time applications. It is, therefore, not surprising to see that cloud computing has become a buzzword in the computing fraternity over the last decade. This book presents some critical applications in cloud frameworks along with some innovation design of algorithms and architecture for deployment in cloud environment. It is a valuable source of knowledge for researchers, engineers, practitioners, and graduate and doctoral students working in the field of cloud computing. It will also be useful for faculty members of graduate schools and universities. 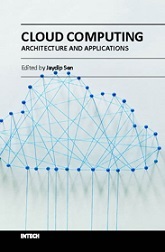 The book establishes concrete, academic coverage with a focus on structure, clarity, and well-defined building blocks for mainstream cloud computing platforms and solutions. Jaydip Sen is a Professor in Praxis Business School, Kolkata, INDIA, working in the Analytics and Information Technology department. He has 22 years of experience in the field of computer networking, information security and computer communication.